The last time actors Sol Kyung-gu and Moon So-ri paired as leads in the same film, they turned in critically acclaimed performances as a mentally disturbed former inmate and a woman afflicted with cerebral palsy heading for a doomed romantic relationship in “Oasis.” In “The Spy: Undercover Operation” (스파이), Sol and Moon again play a couple in trouble, but the trouble is of their own making in a film that is the complete polar opposite of their last collaboration – one that, delightfully, does not take itself seriously at all from start to finish. With that styling in mind, any imperfections in pacing and plot can be forgiven. 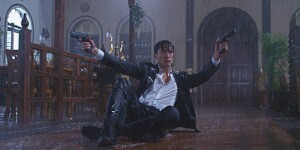 Sol plays Kim Chul-soo, a spy seemingly in control of his espionage career, but not of his situation at home, where the poor man’s version of James Bond constantly faces off against his screechy, hyperactive wife Young-hee (Moon). Because she has no idea about her husband’s real profession, she is increasingly upset about his sudden disappearances for unexplained “business trips” and apparent lack of interest in starting a family. Young-hee herself, though, is also part of the international jet set as a flight attendant, and it’s when her job and her husband’s latest mission collide in Thailand that a hodgepodge of issues such as the reunification of the two Koreas, CIA surveillance, bomb threats and even a love triangle arise – that third party played by Daniel Henney (Ryan) – much to Chul-soo’s increasing agitation, threatening to throw a wrench into an increasingly messy mission. Henney cast as a villain? Sol’s and Moon’s characters running around like nervous wrecks throughout the whole film? Those factors alone make “The Spy: Undercover Operation” a fun watch. It won’t change the face of the South Korean cinematic landscape, but it is a very entertaining way to spend two hours. “The Spy: Undercover Operation” screens at the 2014 Fantasia International Film Festival in Montreal on Aug. 1 at 5 p.m. at the Concordia Hall Theatre. For tickets, go to fantasiafestival.com.